Create a bracelet for any outfit. 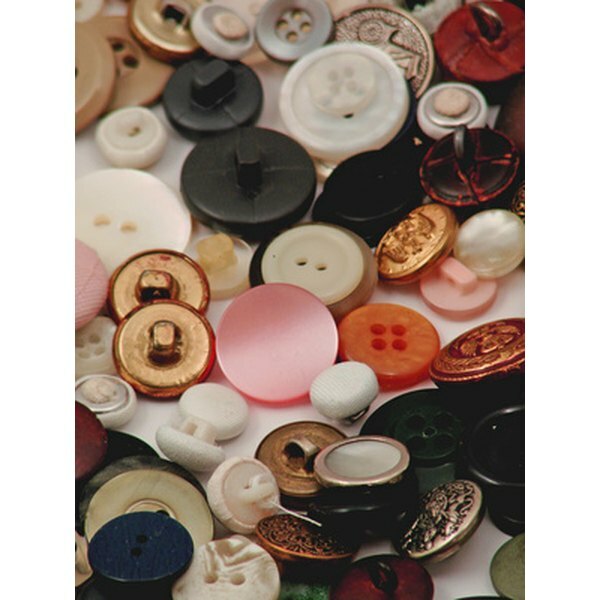 Button jewelry is a versatile and creative way to use decorative shank buttons. Wear and make these bracelets to be worn around the wrist or ankle. You can decide just how glamorous or casual you’d like them to be. Plan ahead and make a few for the holidays to give as gifts. Enjoy this craft on a rainy day with a child, or as a relaxing, inexpensive hobby. If there is a variety of buttons to choose from, arrange them in the order of how you want them to appear on the bracelet. Cut 10 inches of 0.05 mm elastic string. Elastic string for beading can be purchased at a craft store. The thickness of the string will be listed on the package. Slip the first shank button onto the elastic string and tie a square knot around the shank to secure the button. Leave a 3-inch tail at the end of the string. Select the second button and place it on the string next to the first button. Tie a knot around the shank to secure the button. Continue stringing buttons and tying knots. Check the size of the bracelet by looping it around your wrist. Continue adding buttons until the bracelet is the proper fit for your wrist. Tie the elastic in a square knot and cut off any left-over string. Dab craft glue over the square knot to keep the knot from coming apart. Regular buttons can be used as spacers between the shank buttons. Attach a regular two-hole button by pushing the string up from the back, crossing over to the second hole and pushing the string to the back of the button. Browse garage and estate sales for jars of buttons.